Well, the easiest way to stay on budget with clothing is to buy a house! Dave and I have been recording every penny we’ve spent this month to stay on track with the budget we put in place. I’ve been fairly flexible with my spending for the longest time, especially in terms of a clothing budget, but that got quite the revamp this month. It’s hard to get wrapped up in a pretty dress when we have to allocate funds to things like paint and light fixtures. That’s not to say that I’m “banned” from spending money on myself; we’ve actually allowed each other $200 per month of no-questions-asked spending to buy whatever our hearts fancy. It’s just that I’m a lot pickier with my purchases when that $200 allowance is for anything fun for myself, which also includes things like coffee table books and expensive beauty products. (The regular drugstore brands are covered in our household budget.) In addition to the $200, we each have a smaller amount to put in a special savings account for splurges. I’m setting aside $25 per paycheck and any blog money toward the Gucci bag that has captured my fancy. With that in mind, I’ll do away with the quarterly budget next month and just report back on what I did add to my wardrobe. I’m planning to also record our monthly house spending over on Curated Couple. I find it frustrating that many home blogs don’t disclose how much was spent to complete a project or decorate a room. So, I’ll spill the beans over there. It’ll be a monthly roundup with the decorative pieces we buy, along with the practical things like paint, electrical, and hardware. I’ll also be mindful of adding the total cost of completion to any “before and after” posts. Now that that’s out of the way, let’s get to the goods! Lands’ End polka dot bikini bikini top and high-waisted bottoms ($52): I’ve wanted a retro-inspired, high-waisted bikini for the longest time and I finally found the perfect one! It fits true to size and hides any over-indulgences while still being flirty. Chelsea28 ruffle high/low dress in dark floral ($48): I’m sorry to say that the dark floral version is no longer available because the colors are stunning in person. 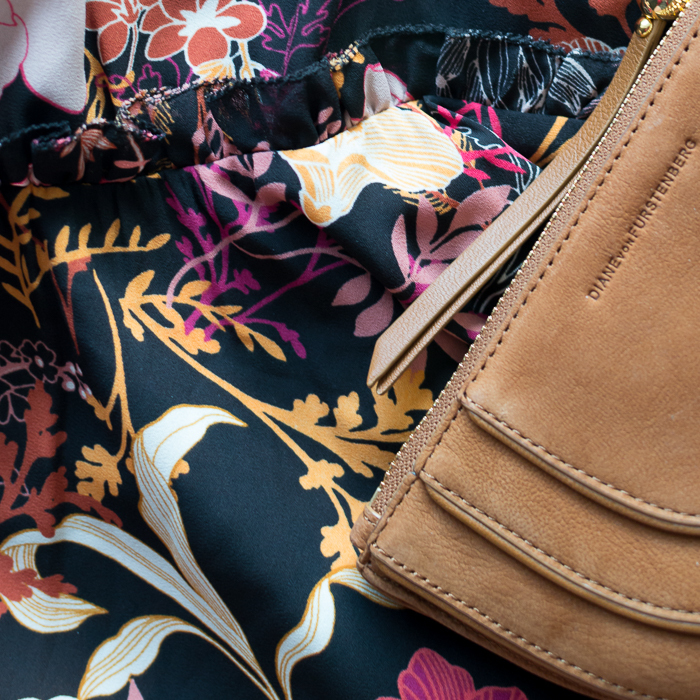 It’s the perfect summer-to-fall piece when we get to that point since it looks gorgeous with burnt orange, gold, and brown. The dress runs huge. I first ordered a medium even though the reviews said it ran large, since I had found that the brand ran small with a few other things I’ve tried in the past. I was swimming in it and exchanged it for a small. It’s still big, but I wasn’t sure I’d be able to comfortably wiggle the ruched waistband over my chest if I went with an even smaller size. It doesn’t bother me, though, since I wanted a dress that was easy to slip on, cool enough for summer heat, and made me look pulled together effortlessly. Old Navy embroidered tie-front swing dress in white: I didn’t love this as much in person as I wanted to. The fabric is too casual for daytime and is better suited for the beach, and since there are no beaches in the foreseeable future, back it went! It runs large. I just love the fringed leather of this clutch — and it’s the exact color I’d like to paint an accent wall in my closet. Statement pieces like this make me feel like I’m putting my budget to good use. I have plenty of basics and it’s nice to freshen them up with an unexpected statement accessory. I’ve wanted these in “brown toffee” for two months now and have been waiting for a sale plus free shipping. (Apparently I’m greedy with the discounts!) It hasn’t happened yet and I’m starting to feel like I should just spring for them while there’s still plenty of summer left to enjoy them. I’m still thinking about this dress, too. And if for some reason I find myself rolling in dough, I’d love to own these watermelon-pink slides. Ugh. I swear, what didn’t I buy is a better question for this month’s shopping confessions. I used our trip to New Orleans as rationale for quite a few purchases early in the month and even then I was still on budget until our weekend in Chicago led me astray. What can I say? Nordstrom Rack will always get me when there’s a deal on a DVF wrap dress and Zara’s trendy pieces are just too good to pass up. I’ll subtract the deficit from next quarter’s budget to stay on track with my annual allotment. LOFT Floral Lace Striped One-Shoulder Top ($38): With floral lace trim and stripes, what’s not to love about this top? 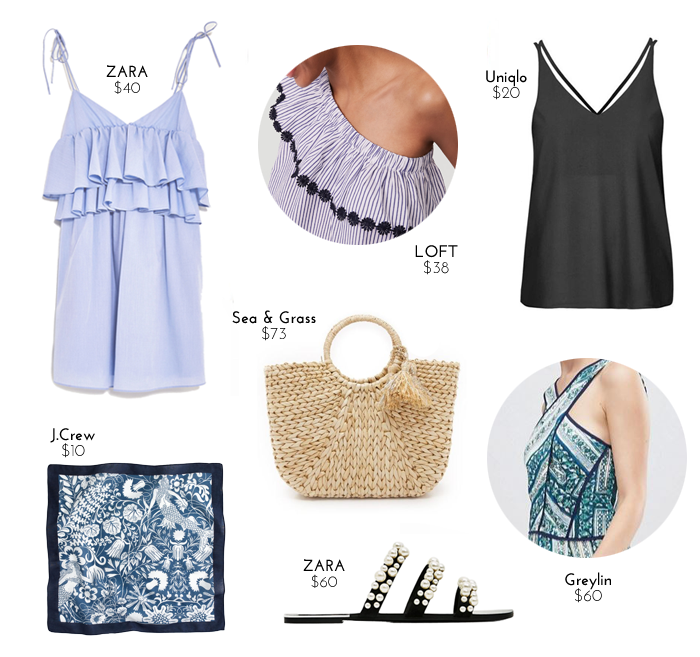 It’s such a pretty take on the one-shoulder trend. I wore it with denim shorts in New Orleans. Order your regular size and a size down to try them both. I liked the torso more in the small, but the elastic felt uncomfortable under the arm so I went with the medium. Greylin Karissa Cross Front Printed Skater Dress ($60): ASOS has some great sale finds if you’re patient enough to sift through hundreds of pages of merchandise to find them. I fell in love with this dress for its cross-strap detail in the front and the flattering piping. It’s no longer available, unfortunately. Sea & Grass Market Tote Bag ($73; featured here): The bag featured above is similar to the one I actually purchased on Etsy from Sea & Grass (a.k.a. my newest handbag obsession). It looks like they raised the price of the tote to $85 after I purchased it, but I’d still recommend it at its current price. I used it every day in New Orleans and it fit everything I could possibly need for a day out. The craftsmanship of the bag is beautiful and the semi-glossy finish makes it water resistant if you choose to bring it to the beach. ZARA Pearly Strappy Sandals ($60): I feel like my style is completely on point whenever I order something and see it on Blair the next day. 😉 I just love these sandals. They’re basically jewelry for your feet. J.Crew Bandana in Mermaid Print ($10): I’m all about the scarf and bandana trend this spring. I’ve been wearing a lot of blue lately, so this one seemed like a no-brainer to coordinate with this season’s ensembles either tied around my neck or on the handle of my bag. ZARA Strappy Dress with Frills ($40; worn above): I kind of feel like a flouncy cupcake in this dress. I can’t say it’s the most flattering thing I own, but it’s just too fun. It’s lined, which was a nice surprise for such an inexpensive dress. I went up a size. Diane von Furstenberg “Julian 2” Mini Wrap Dress ($70; not pictured): I found this at Nordstrom Rack in Chicago and couldn’t stay no to such a deep discount on a flattering wrap dress. The color scheme I went with has a magenta background. I’m looking forward to wearing it to work this spring and summer. Uniqlo High-Rise Drape Shorts in black ($30; not pictured): I bought these to wear with the black tank top I also picked up at Uniqlo. Together, they create the illusion of a romper, but it’s way more practical when ducking into the ladies’ room. These were great for travel, too, since the fabric didn’t wrinkle even when shoved in a suitcase and taken out only on the last day. Uniqlo Tank Top in black ($20; similar to the one above): I wish this was available online. It’s similar to the Topshop one above only without the double strap detail in the back. It’s the same material as the shorts, making it great for travel. GlassesUSA “Muse” Sunglasses: I just love the matte finish! Sweet & Spark Vintage Floral Earrings: I brought them to New Orleans and featured them in this Instagram. I’ll post a snapshot on the blog soon! In the meantime, you can meet the curator of Sweet & Spark here. 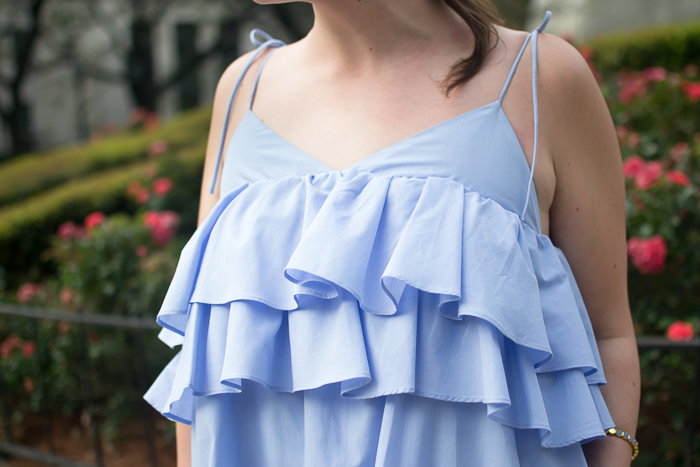 Make Me Chic Off-The-Shoulder Ruffle Dress: As with most items from these types of retailers, this dress is ultra short. I’m actually going to take it to the tailor to have hemmed into a shirt. Prada Round Sunglasses: DITTO is unfortunately ending its Endless Eyewear program. I had credits remaining from my partnership with them and spent them on this pair of sunglasses. They’re ridiculous, but pretty fun to wear. If you have your eye on any designer sunglasses, check to see if DITTO is carrying them first. They’re 50% off right now and final sale. Shop the sale here. ASOS Salon A-Line Lace Mini Dress: I so badly wanted this to work! While it’s incredibly adorable in person, I just didn’t see myself wearing it more than once or twice. (It’s okay, though. I did buy a yellow dress in January!) If you have a special occassion coming up, give it a whirl! I found that it ran large around the chest, which is really the only place you’re fitting this for. LOFT Vine Sleeveless Shirt Dress: I’m really surprised this is almost out of stock already. It’s fine, but I thought the pattern seemed too old-fashioned in person. The loafers I’ve been contemplating for over a month now. I’ll be linking up with Fran! You know how much I love a new dress and the holidays are the perfect excuse to shop for luxe, embellished pieces. Think: sequins, lace, satin, and velvet. I picked up this sequin dress to wear to Dave’s company holiday party in a couple of weeks. (It’s also available here and in plus sizes here and here.) I also love this long sleeve option and this colorful number. Looking for more colorful options? Try this sapphire velvet dress (the ruffle at the bust adds oomph to a small chest) or this playful jacquard option with mixed prints.